Friends of Hemlock Bluffs Board Meetings are typically open to the public. The public may attend and quietly observe from the sidelines. Members in good standing may attend and participate, but they may not vote. Members who attend a meeting and decide they wish to serve on the Board may apply for any open Board position by making their interest known to the Board in writing via email to: fohbsecretary@gmail.com. There is a formal application process with an application to be completed and submitted by the interested individual and follow up discussion by the Board. If you are interested in attending an upcoming Board Meeting, please email ;fohbsecretary@gmail.com to confirm the meeting time and location. We welcome interest in Board Meetings and encourage members to become active members of the organization! 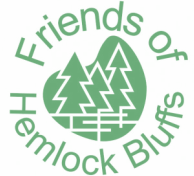 Throughout the year, the Friends of Hemlock Bluffs is involved with several events, both at the Preserve and in the community. These events benefit the preserve and promote the Friends organization. Friends Board members typically handle the "manning" of promotional booths, serving refreshments at preserve events and organizing Friends fundraising events. Members who would like to become involved with these type of events are encouraged to contact us to help. It's a great way to meet community members who love Hemlock Bluffs Nature Preserve, to share your love of Hemlock Bluffs and to help raise funds for the preserve we all know and love, Send an email to fohbsecretary@gmail.com to volunteer. We could use the help!